Not long ago I was lucky enough to help someone who was searching for a way to make “Pumpkin Bars” with gluten-free flours. She gave me her recipe and when I researched it, I found it in food magazines, a wide assortment of cookbooks, and all over the internet. Interestingly, several junior league cookbooks called the exact same recipe “Pumpkin Sheet Cake”. The only difference was that it was baked in an 11 x 17 inch baking pan instead of one slightly smaller (10 x 15 inches). I came to realize that “Pumpkin Bars” had been around for a long time even though I’d never had one. Being a great lover of all things pumpkin I thought I might have to try to make them. Sous Chef boy (my younger son Brad) was skeptical. “Because these are fast and easy to make. They’re like a quick pumpkin fix and they have frosting,” I answered with a huge smile. Well that changed everything. He nodded his approval and left the room to do homework. When I started comparing recipes I realized they were all almost identical, with only minor variations in spice, oil and sugar. The recipes also made A LOT of pumpkin squares because they called for a 10 x 15 inch pan. I decided that I wanted to make a smaller amount so I cut it in half and used an 8 x 8 inch pan. I kept the cinnamon but increased it a bit and left out all the various add-ins that bakers had used to make the recipe their own: nutmeg, cloves, nuts, and raisins. Almost all the versions had a basic cream cheese frosting made with a combination of butter and cream cheese and more or less sugar. Some had vanilla and some were strangely (to me) without it. I wanted something more and so I added a touch of allspice to mine, but you can leave it out. Allspice is delicious with pumpkin and cinnamon. Sous chef boy kept darting through the kitchen anxiously waiting for just the right moment when the Pumpkin Bars would be cold enough for us to cut into them. He was waiting to put out “the alert” to our many friends on the block who are highly trusted “tasters” for me. They may grouse and groan when I beg them to eat just one more sample of Chocolate Bundt Cake, or Whoopee Pie, or Orange Chiffon Cake, but they always come through. It’s a hard job, but someone’s got to do it, right guys? Perhaps you’ve had a hankering for pumpkin bars and want a quick fix? Try my gluten-free version. They’re so good you won’t miss the wheat. And be sure to let me know what kind of frosting you like! 1. Preheat oven to 350ºF. Position rack in center of oven. Grease bottom of 8-inch square baking pan with cooking spray. 2. Beat eggs, sugar, oil and pumpkin in large bowl of electric mixer for one minute at medium speed. Add flour, cinnamon, baking powder, baking soda, xanthan gum, and salt and mix at low speed until well combined and smooth. 3. Spread batter in prepared pan and bake in center of oven 25 – 30 minutes until puffed and cooked through (toothpick inserted into center should come out clean). Cool in pan on rack. 4. Spread Cream Cheese Frosting over the top when completely cool and refrigerate, covered until cold. Cut cake into bars and serve. Serve chilled or at room temperature. Bars can be made a day ahead. Store in refrigerator for up to four days. Bars can be wrapped with plastic wrap and then with foil and stored in freezer for up to two weeks. *Find the Brown Rice Flour Mix under Guide to Flour Mixes section on this blog. 1. Beat butter and cream cheese in large bowl of electric mixer until light and fluffy. 2. Add confectioners’ sugar, milk, vanilla and allspice (if using) and beat at low speed until blended and smooth. Let me know if they taste like the ones in the recipe you asked for help converting. Looks good enough to eat, and eat, and eat. However, I’m with sous chef boy. Hot and cold running caramel everywhere and on everything! Oh! So you’re a caramel lover, too Laurel? If you try it – let me know! Mattie is the most wonderful resource for all things vegan as in you also can’t metabolize dairy or eggs. You should wander through his website sometime. I’ve got to try these, love pumpkin!!! Can’t wait! I made these this past weekend, and used King Arthur’s gluten free flour blend, and they were FANTASTIC!! Thank you so much for the recipe. I will be making them again for Thanksgiving. Even my non-gluten free friend who was over for dinner gave them rave reviews (my family has gotten used to gluten free so I valued her opinion of them more than theirs). I am SO glad the King Arthur blend worked on this recipe! Thank you for letting me know. These are delicious! I find it odd that all the original recipe calls them “bars.” I think it is more like a yummy, easy cake. Whatever you call it, I’ll make it again. Maybe with raisins! I am interested to know what kind of caramel topping your son would recommend. Is there a recipe? There’s a caramel sauce that I use from my Gluten-Free Baking Classics book in the Pumpkin Bread Pudding Recipe. The same recipe is in The Gluten-Free Good Health Cookbook in the Caramel Cheesecake Pie recipe. And there’s always store bought! Annalise, you’ve done it again. Such a wonderful recipe even without the eggs. So, I changed the recipe a little. Folks, she asked me to, honest. Why else would I mess with perfection? So I basically followed the recipe substituting granulated coconut sugar for the white sugar and light olive oil for the canola oil. Then I used 1 full Cup Pumpkin Puree; added 1 tsp ginger and allspice each to the cinnamon; used 1 tsp EACH baking powder and baking soda. I ground up chia seeds and used 1 Tbsp ground chia seeds added to 1/4 Cup hot water and let them gel. I did not use xanthan gum at all. Plus I added 1/2 Cup of bittersweet chocolate chips. I baked it for 40 minutes, but that may have been my oven. It is light, it is fluffy, it is moist, it is cakelike. Annalise thanks for the opportunity to put my theories to the test. Amazing transformation. I am happy that the recipe held up for tweaking. Thank you Laurel!! These look delishous! I stumbled across your cookbook on Amazon and was interested in buying it, but wanted to ask you if you had tried egg substitute on any of your recipes, or if most of your recipes called for eggs. My son has multiple food allergies and so I have to eliminate milk and eggs in addition to all gluten, and I don’t mind playing around with recipes a little, but if there are a lot of eggs, that can be difficult to work around. Thanks! Because my recipes are only gluten free and “classic”, I do not provide egg substitutes, but many bakers have been successful (see comment above, for example) using my recipes and doing their own tweaking based on their experience with substitutes they like.The methods depend on the bakers other allergies, palette and tolerance. I have noticed there are a lot of different ways of doing it: silken tofu in my breads and some of the cakes and muffins; flax and chia seed emulsions in cakes, muffins, etc., and applesauce and bananas in others. Some use egg replacer or homemade egg replacer. I have a huge file of feedback from egg-free bakers who have written. So I know it is can be done with my recipes- and yes, some work better than others. Some bakers use extra baking soda or baking powder in a recipe depending on what the recipe is and what sub they are using. It seems the permutations are many. Bottom line: because my focus has not been on replacing eggs, I haven’t tested options and can’t really provide you with the best way to do for each recipe. But if you are experienced with egg-free baking (and there are some really good egg-free cookbooks out there you can use for guidance), you should be able to adapt my recipes successfully. Hope this helps you a bit to make up your mind. You can always try the recipes I have here and on my website first and see how they work for you. That way,there won’t be a financial investment until you make a decision! I made these bars and they were delicious. I will be making these for Thanksgiving at my sisters house. I gave her one to try for dessert later that day(I had them frozen) and she told me they were so good she almost drove back to my house for more. After reading Laurel’s recipe with chia seeds I tried that version instead of making with xanthum gum and used slightly more pumpkin and they came out very good, a little denser though. I think for a mixed crowd, (GF and non GF) I would make the original recipe – the crumb was perfect and very much like cooking with wheat flour, and these use such a small amount of xanthum gum anyway. Love these bars. I love your post. Your sister is a woman after my own heart. anyone know of a good cream cheese replacement? that isn’t “cows milk ” cream cheese?? so excited! Although I haven’t tried them myself, I checked with Laurel (above) and she mentioned three: So Delicious just came out with a Greek style cream cheese. There’s also Tofutti and some other brand of soy cream cheese. (And by the way, No So Delicious also just came out with a Greek style yogurt.) Hope this helps a bit! I can’t wait to try this recipe! I have a quick question about doubling recipes. How do you double your recipes, and specifically bread recipes without major accidents? This particular recipe can be easily doubled and baked in a 9 x 5 inch pan. And many of my recipes are also easily doubled by just making twice the recipe (cookie doughs and tart crusts, muffins, sweet breads, and breads are typically easy). When I double breads that use 1 1/2 cups of flour, I do not double the yeast. Otherwise, for 2 and 3 cups recipes, I do. Cakes can often easily be doubled- but not always; it will depend on ingredients and the type of pan. Cakes with a lot a eggs are more of a challenge. So that means that I can make 2 loaves of bread at once, instead of one after the other? That will save a lot of time. I would be using a 3 cup recipe. Do I have to change any other ingredients, or can I just double everything? If the recipe calls for 3 cups, double everything including the yeast. Let me know how you make out! So glad you found your way to this recipe- especially at this time of year. It’s a perfect autumn treat. Thank you for writing! I just made your recipe. They smell amazing!! I cannot wait to try them. Thank you for posting this recipe! They are excellent!! Thank you for the recipe. Annalise, your gluten-free recipes are an enormous hit in my house. Prior to me purchasing your Gluten Free Baking Classics I was lost and frustrated with numerous GF disasters in my kitchen. My 5 yo son has celiac disease, and your recipes have allowed him to have a fairly normal childhood. You are a genius! I just tried your pumpkin bars recipe, and it’s awesome!!! Thank you so much for sharing! I’m glad that my recipes are making it possible for you to enjoy baking for son, and perhaps even more important, are allowing him to have some of his favorite foods and to feel more like everybody else. I know how important that can be because one of my sons was diagnosed a couple of years after I was. It was so nice to be able to make him the same treats I had always made him- but gluten-free. And being able to make gf pizza for him (and me!) was huge. I hope you are able to bake your way through a lot of my recipes- especially with the holidays coming! Let me know if you ever have any questions. Our adult son with Cerebral Palsy/Autism & myself (mom) learned few years ago that we’re allergic to wheat/gluten. Truly appreciate your Yummy gluten free recipes. Few days ago a neighbor gave us an 8 lb pumpkin, been debating what to make, checked my gluten free list & Gluten Free bars will be our desert for a few days. Waiting for a Zojirushi Breadmaker to make Gluten free bread as well. Thank You !! Those pumpkin bars are really easy to make, which is good, because they never last long in my house when I make them. I hope you and your family enjoy them! Please let me know if you have any questions once you get that bread machine. And happy holidays! Great news, new Zojirushi breadmaker arrived about 3 weeks ago, what a special treat! Lots of 1 lb recipes, made Brown Rice Bread, better than any store bought bread & lots cheaper. Went to Zojirushi.com & found a “Miracle Meatloaf” recipe (among other enticing recipes)it can be tweaked for a very small loaf. Can’t wait to try it. Best breadmaker I’ve owned. Only 2 light eaters in family. It is a great machine. Well made and dependable. I hope you enjoy it! These were amazing!! I used mostly buckwheat flour with a few spoonfuls of rice flour. My non-gf friends loved it too. I used sucanat and added a pinch of cardamom and nutmeg. They’re great plain, and I also used a vanilla-y powdered sugar frosting (but would prefer cream cheese, just didn’t have any!). I wish I could find more recipes using 100% buckwheat. I make pancakes and waffles with it all the time and they turn out great. I think even this recipe would be great with 100% buckwheat. Wonder if there’s a book out there somewhere about baking with buckwheat? I’m new to GF baking, and don’t really care for the flour blends that have bean flours. Buckwheat seems to be a reasonable wheat replacement, to me. Guess I’ll just have to experiment! Thanks for this awesome recipe, it was just what I needed – quick, easy and very, very tasty. So glad you enjoyed them! Your variation sounds delicious and I’m glad my recipe was solid enough for tweaking. Not sure if there is a book out there with just recipes using just buckwheat flour. I think most recipes for gluten-free baked goods include a variety of flours in order to achieve a texture, taste and appearance that is more like regular all-purpose wheat. However, whole grain baking is becoming more popular and buckwheat is a delicious alternative for those of us who can’t eat whole eat, so keep exploring! These were so amazing! We are not sweet people, so I cut the sugar in the bars and frosting in half, and it was perfect! Yum! So glad you enjoyed them! It’s an easy-to-make recipe that’s fun to eat with or without a lot of sugar! I made these as a trial for Thanksgiving and they were delicious! Definitely making these for the holiday, they were so much like the gluten-filled version and we ate them all in one day! Thank you for sharing this recipe. Thank you for letting me know how much you enjoyed the recipe! I have to say, those pumpkin bars don’t last very long in my house either. In fact, it was hard to keep pieces around to be able to test how long they stayed fresh in the frig so I could write it into the recipe. I hope you and you family have a delicious holiday season! I am excited about making your pumpkin bars as well as many other things from your site. I have been gluten-free after discovering I was gluten intolterant about six years ago. After trying to bake and foods tasting great but falling apart it became easier to buy prepared mixes. However, I am now a newly diagnosed diabetic and am committed to eating healthy and responsibly. So it is back to doing my own baking and starting from scratch. I am SO glad I found you and your blog!!! Do you know if this recipe works well with a sugar substitute? I’m excited to try this recipe. It will be my first time baking since being diagnosed with gluten intolerance a few years ago. Would there be a difence if I use an 8×8 Pyrex? I tested it in a metal baking pan, and so did my field testers. But you should be able to use a glass Pyrex; you might have to adjust the temperature down by 25º F, but I’m not 100 percent sure. For example, I use glass pie pans most of the time and never turn the temperature down. Please let me know how you make out. And I hope you have a delicious holiday! Wow! Best pumpkin bars ever. Thanks for the wonderful recipe. These are so fantastic! I tasted them without frosting and with. Either way these are so very delicious! I am making them for Passover because being gluten free now I have no gluten in my house so everything is kosher for Passover! Yea ! Thank you! I really love this recipe, too. It’s easy to make and people smile when you serve it and then ask for more. Best kind of recipe! Thank you for writing to let me know you like it. 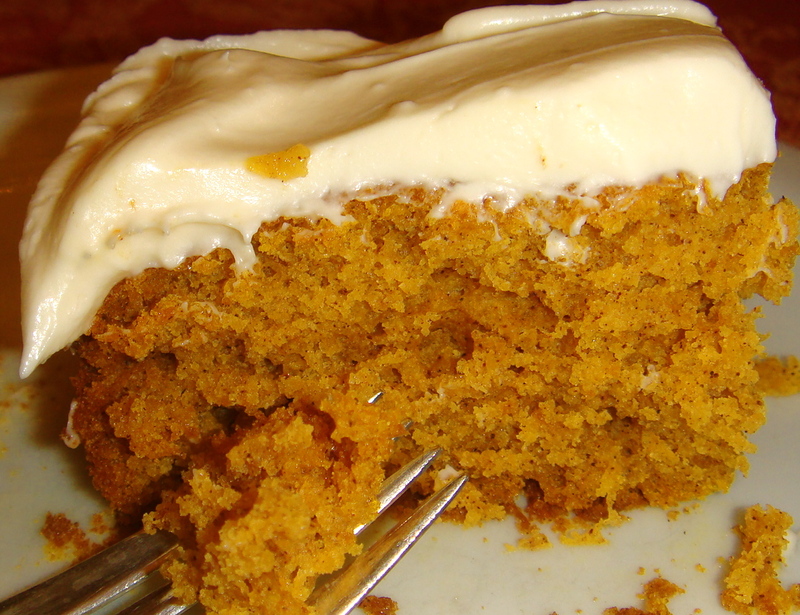 Glad to hear you enjoyed the pumpkin bars -and that they worked well with erythritol! If you are a pumpkin fan, there is a really good pumpkin muffin recipe on my FoodPhilosopher.com website that you might want to try. I also hope you enjoy Gluten-Free Baking Classics, once you get it. There are a lot of basic recipes that are really easy to make– and they’re designed to work well every time you make them. Let me know if you have any questions as you get started. PS. I have a new book coming out in the fall with a lot of delicious new recipes – including a pumpkin bundt cake that you may enjoy. Annalise, I am making these pumpkin bars tonight for a house full of company and for the very first time. I have confidence baking any of your recipes knowing that they will come out perfectly and enjoyed by everyone – gluten free or not. I own two of your cookbooks and I’m so thankful for them. Before your cookbooks I struggled baking gluten-free. I was formally a huge baker, baking bread and cookies on a regular basis. Mostly I missed pie because I could not come up with a good gluten-free crust that was not tough. Thank you for putting science behind the baking and cooking. That’s what I love most about your approach. It is tried tested and true. Thank you for your very kind words. 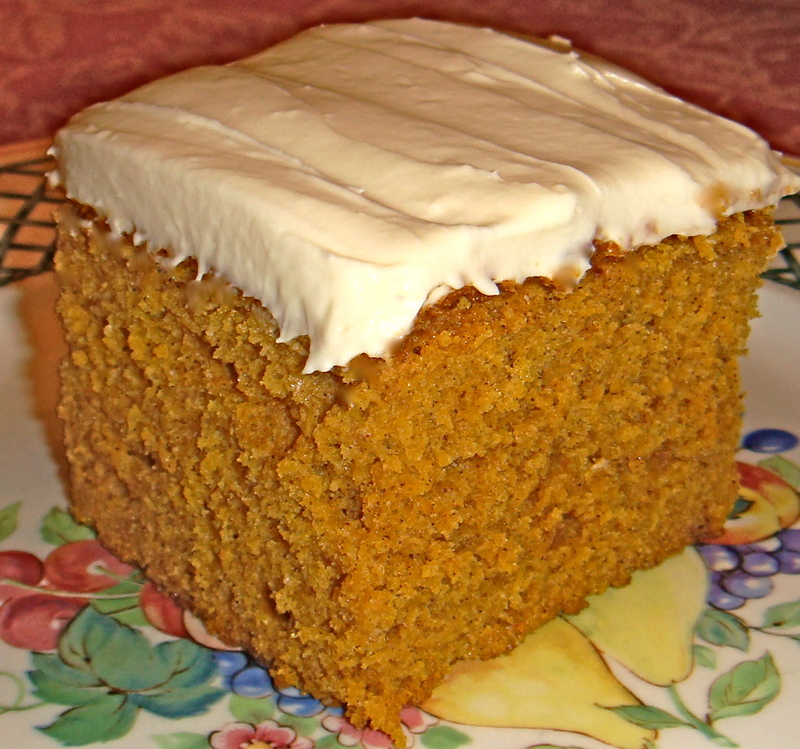 Those pumpkin bars have been a very popular recipe among my readers- and in my own household. I hope you enjoy them as much as I do. You might in interested in knowing that I have a new baking cookbook coming out next month. It has 90 recipes (only some of which have appeared on this blog; most are new) and a whole chapter on converting recipes. I also spend a lot of time teaching about gluten-free baking in the first several chapters, and then again, in the introduction to recipes throughout the book. I hope you have a chance to take a look at it! I trippled this recipe to use in my 11.5 x 17.5 baking sheet that I have always used for traditional with gluten pumpkin bars. Serves a crowd. This worked perfectly and no one could tell it wasn’t gluten free. I can’t see why you couldn’t double for 9 x 13 inch pan as well. This is a huge win as my family has always loved pumpkin bars and we are new to the GF scene. If you want to save money, you can use less cream cheese and still have great frosting. Thanks for the recipe! I’m so glad to hear that you were able to triple the recipe and that it worked well. I’ve heard from many people who said they successfully doubled it, but you have reassured me that the recipe is solid enough to go large! If you’re a pumpkin lover, you might also try the pumpkin roll and the pumpkin filled coffee cake here on this same blog. They’re really delicious.